Vein disease can cause serious health problems. Unfortunately, it often goes undiagnosed. General practitioners and physicians in other specialties treat the symptoms of vein disease without pinpointing the root cause. If you are experiencing any signs of an underlying venous disorder, it is critical to see a specialized vein doctor in NYC. These experts have the tools and training needed to find the source of the issue and recommend the best vein treatment to solve the problem. What Does a Vein Doctor Do? Many people are under the impression that the only physicians who specialize in vein disease treatment are vascular surgeons. They believe that eliminating unsightly varicose veins requires an invasive vein stripping procedure, complete with a hospital stay and a long recovery period. Fortunately, there have been significant advances in this area of medicine. Today, seeing a spider vein doctor or varicose vein doctor rarely results in surgery. Instead, these specialists use state of the art diagnostic tools to understand the cause of your symptoms, and they offer minimally invasive treatments on-site at the varicose vein treatment center. Physicians who specialize in venous disorders are called phlebologists. They have in-depth training on vein conditions that impact circulation, like blood clots, inflammation of the vessels, and damage to the structure of veins. They are particularly skilled in the use of ultrasound, which is a critical tool for examining vein health. Once they have diagnosed the cause of your discomfort, they can recommend and complete most treatments without referring you to a vascular surgeon. Varicose veins and spider veins are the most visible signs of vein disease, so they are the most common reason that patients seek treatment. Varicose veins are the thick, twisted, ropelike vessels that protrude against your skin. Spider veins are visible just under the skin, and they look like a net or web. Varicose and spider veins typically develop when there is damage to the structure of the vessel. Veins have tiny one-way valves that ensure blood flows in the right direction. When they don’t close properly due to injury or disease, blood can leak backwards and settle in the lower part of your body. This condition is called Chronic Venous Insufficiency (CVI). The pooling blood puts pressure on the vessel walls, which weakens them. The veins swell, causing varicose veins and spider veins to appear. Though spider and varicose veins are the most obvious symptoms of vein disease, most patients experience other signs – sometimes before they even notice bulging veins. For example, you might have swelling in your legs and ankles, or your lower half might feel tired, numb, achy, or tingly. In some cases, patients have sudden, severe leg cramping. This often occurs at night. In other cases, patients develop Restless Leg Syndrome, which is a constant urge to move or stretch your legs. This is most common at night, too, which means vein disease can interfere with your sleep. Over time, untreated vein disease can lead to changes in your skin. The area around the swelling might feel tight and itchy, and you could notice changes in your skin’s texture. As the problem gets worse, skin may become discolored. At this stage, it is quite fragile, and it loses its ability to heal properly. That means minor cuts and scrapes can be a big problem. Long healing time gives bacteria an opportunity to get inside, causing painful skin infections. It is usually possible to prevent this sort of damage by getting an accurate diagnosis and appropriate treatment as soon as you notice symptoms. Your vein doctor in New York or vein doctor in New Jersey can help. What Vein Disease Treatments Are Available? Depending on the cause and severity of your symptoms, your vein doctor in NYC might recommend simple remedies that you can do at home. For example, resting and elevating your feet and wearing compression socks or compression stockings can relieve your discomfort. However, if these don’t do the trick, there are a variety of alternatives available on-site at your varicose vein clinic or spider vein clinic. Cutting edge varicose vein and spider vein treatments rely on the same basic principle. They are all designed to permanently close unhealthy veins, allowing blood to automatically reroute to other, healthier vessels. The tissue from the closed veins is reabsorbed by your body, dramatically reducing or completely eliminating the appearance of unsightly spider and varicose veins. Each of these has been proven safe and effective. Your vein doctor in NYC begins the procedure by using a bit of local anesthetic on the treatment area to ensure you are comfortable. The next step is to access the unhealthy vein through a small incision in your skin. These incisions are so small, most don’t even require stitches. With the help of ultrasound, the treatment is delivered. The entire process usually takes under an hour from start to finish, and you can return to your normal activities right away. How Do I Choose a Vein Doctor in NYC? Before you book an appointment with any vein doctor in NYC, carefully examine his or her qualifications. Vein specialists should be Board-Certified, and they should have specific education and experience in venous disorders. It is important that they have expertise in ultrasound as well, since this is a critical component of the diagnostic and treatment process. The vein doctors at the Vein Treatment Clinic are known for their expertise in managing vein disease. 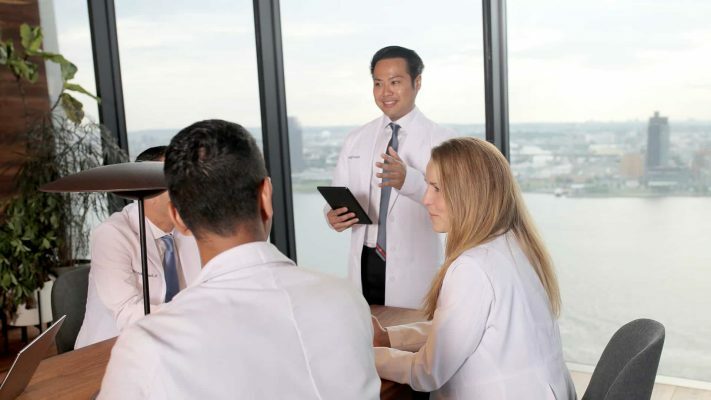 The practice is led by Dr. Michael Nguyen, and it operates on an important philosophy: open communication and strong patient/physician relationships are key to high-quality healthcare. Most Vein Treatment Clinic doctors are open to communication by email or text, which ensures your questions and concerns are addressed promptly.